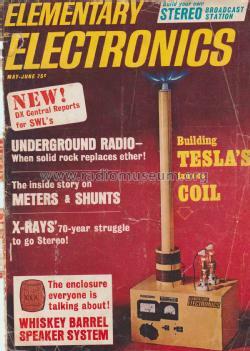 Elementary Electronics began in 1960 as a yearly special edition with a slant toward more basic electronics ("How a Transistor Works," "Reading Schematic Diagrams," "Basic Electricity," etc were typical articles). In 1965, the magazine was issued quarterly with articles divide into "Theory" and "Construction." Starting in 1966, it became a bi-monthly magazine and added a "Features" section.